Why Are These Massive Cargo Ships Trapped at 29 U.S. Ports? You've probably read about it, even if it didn't really register. Something about a backlog. Something about unions. Imports and exports. Now the dispute that's paralyzing 29 ports on the U.S. West Coast has the potential to affect all of us—and to empty the shelves in countless stores. West Coast ports were shut down over the weekend, as part of a strategy designed to win a fight that pits the dockworkers—basically, the skilled workers who keep the ports running—against the shipping companies. The dispute's actually been going on for months, as has the congestion. But things are coming to a head this month, blossoming into a straight-up traffic jam this weekend: The LA Times says there are now 33 ships anchored along the coast, while 55 are at a stand-still in port. Consider that each of those ships is carrying thousands of containers, and that 40 percent of American imports (and 70 percent of trade from Asia) come through the ports of LA and Long Beach, and you'll get a sense for the scale of the stand-still. Yesterday, the CEO of the National Association of Manufacturers said that the situation is costing $2 billion a day. The dispute is between two parties. First, the International Longshore and Warehouse Union or ILWU, which represents 20,000 dockworkers who are highly-skilled, highly-paid workers. Then, the Pacific Maritime Association, which is represents the shipping companies. They've been slogging towards a new deal for months, but have had trouble agreeing on a number of issues, including how contracts are arbitrated. The shipping companies of the PMA blame the dockworkers, claiming they are staging mass "slowdowns" in their work that creates congestion. This weekend, the PMA locked out workers entirely to put pressure on their union to sign a contract deal. Meanwhile, the ILWU shot back that the PMA, describing the lock out as unnecessarily aggressive. "The employers are deliberately worsening the existing congestion crisis to gain the upper hand at the bargaining table," said the ILWU pesident Robert McEllrath in a statement. In short, it's a battle between two very tough opponents who need each other to survive. Today, the AP reports that the PMA is distributing the contracts directly to workers on the ports, seemingly to undermine the union bosses who are negotiating directly with the association. This week, President Obama even went so far as to sent Labor Secretary Thomas Perez to help end the stand-still, leading some speculate that Obama could pull a "nuclear option" on the talks. So it's just a labor dispute? No. Though the dispute is exacerbating it, there are way bigger issues at play here—like America's aging port infrastructure and its ability to keep up with the flow of trade through its ports. The best explanation of the problems come from Forbes and The Washington Post, which explained this week that there's simply so much more cargo leaving and entering America right now than there ever has been. More cargo means more containers, which means more ships, and of course, bigger ships. That's not bad news in and of itself. 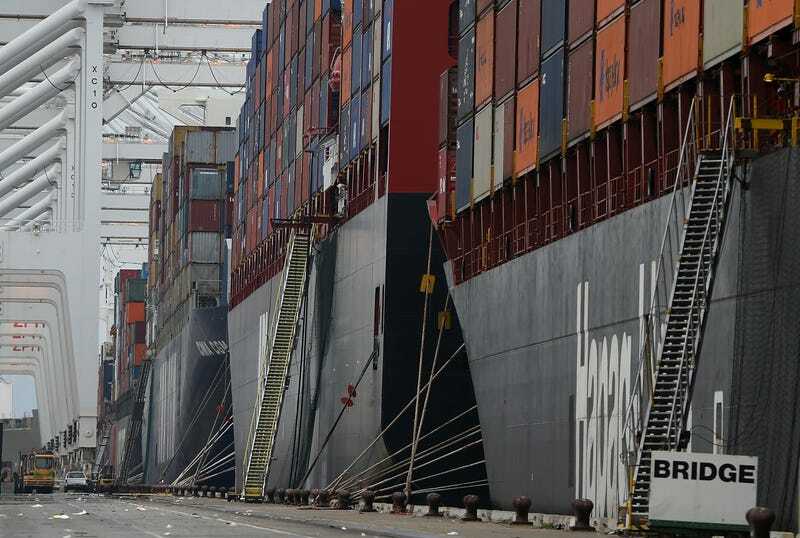 But the way those ships are unloaded—and what happens to the containers once they're off the ship—is much more complicated than it once was, and American ports have had a hard time upgrading their systems to handle the complexity and increased load. A longshoreman with the union's Local 13 branch, looks out at the unusually quiet dock at the Port of Los Angeles in January, 2015. AP Photo/Damian Dovarganes. Why can't they just put my stuff on a train? Good thing we didn't turn all our railroads into bike paths and garden beds, right? There's just one problem with relying on trains for transport: America's train infrastructure is also stretched to a breaking point, as Forbes also pointed out in its story. As North Dakota's oilfields have exploded over the past few years, it's depended on outdated railways to transport its black gold. As a result, it's been increasingly difficult for other customers to find a way to ship their goods via train. Last year, we learned that the oil boom is causing huge problems for companies that depend on railways, from farmers to carmakers. How will any of this affect me, lady? It might not today, but businesses across the country are already having trouble stocking products, from shoes to, uh, NBA bobblehead dolls, apparently. It's definitely adversely affecting companies who depend on international trade—from farmers who export to China to stateside manufacturers who get their parts or materials from abroad, like Honda. It's probably going to take some time for it to have an obvious effect on you, but if the slowdown continues, it may very well mean you won't have access to certain foods and products, including cars. If you want a deep dive into the booming world of US freight, check out Dan Glass' amazing post from October here. But here's a few numbers: A mind-boggling 40 percent of everything imported into the US comes through the Ports of the LA and Long Beach. Consider that roughly 90 percent of everything we own arrives on a cargo container, you'll see why a shutdown—or even a slowdown—could impact everyone. Oh yeah: The LA Times says all those idling mega-ships are making the air quality in Southern California worse. Bonus! Lead image: Container ships sit at the Port of Oakland on February 17, 2015. Photo by Justin Sullivan/Getty Images.